Biathlon combines cross-country skiing with target shooting. Individual events feature either two or four shooting bouts, executed while standing or in the prone position. Norway’s Ole Einar Bjørndalen, also known as "The King of Biathlon," is the winningest athlete in the history of the Winter Olympics, with 13 medals to his name. Men race 20km, while women race 15km. There are four shooting bouts in the individual event, two standing and two in the prone position. Athletes are permitted five rounds of ammunition per bout. The sprint even is identical to the individual event, though all of the requirements are cut in half. Men race 10 km and women race 7.5 km, with only two shooting bouts, one standing and one prone. Gold medal winners from the individual and sprint events are given a head start while the rest of the competition waits at the starting gate. The event — which features four shooting bouts — then continues on as usual, with men racing 12.5 km and women racing 10km. 30-plus athletes barrel down the course before completing four shooting bouts. Some are faster skiers while others are more proficient with the rifle. Men race 15 km while women race 12.5 km. Four skiers represent one team, with each athlete racing a quarter — 7.5 km for me, 6 km for women — of the total course and completing two shooting bouts. With four medals in two olympic games, he is looking good to double that count with four individual gold medals this year. With zero medals from one olympic appearance, she is expected to win three individual medals (one of each medals) this year. She's expected to win three individual medals this year, one of each. He's expected to win four individual silver medals. Contributing Writer. "Biathlon in Winter Olympics." 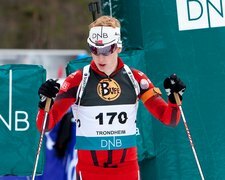 Sciencing, https://sciencing.com/biathlon-winter-olympics.html. 29 January 2018.